This year, I decided to fill my part sun/part shade containers with plants chosen for foliage interest. My taste in outdoor plants seems to be the opposite of my taste in houseplants, since outdoors, I tend to choose plants mostly for their flowers, rather than their foliage. So I thought I'd try something different. 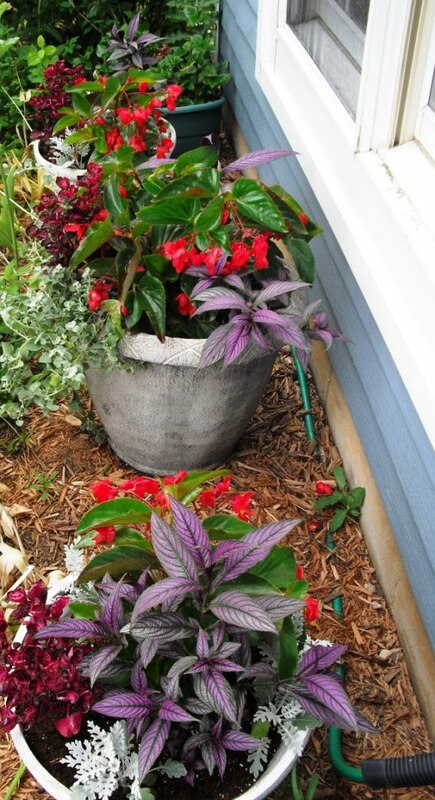 I picked Iresine herbstii, (Bloodleaf) Strobilanthes dyerianus, (Persian Shield) Senecio cineraria, (Dusty Miller) and Begonia 'Dragon Wing' for these containers. The last does flower pretty much continuously, but I consider it a foliage plant in this case, since I purchased it because I love the way the leaves look. I like the red flowers, too, but consider them a bonus, rather than the main attraction. 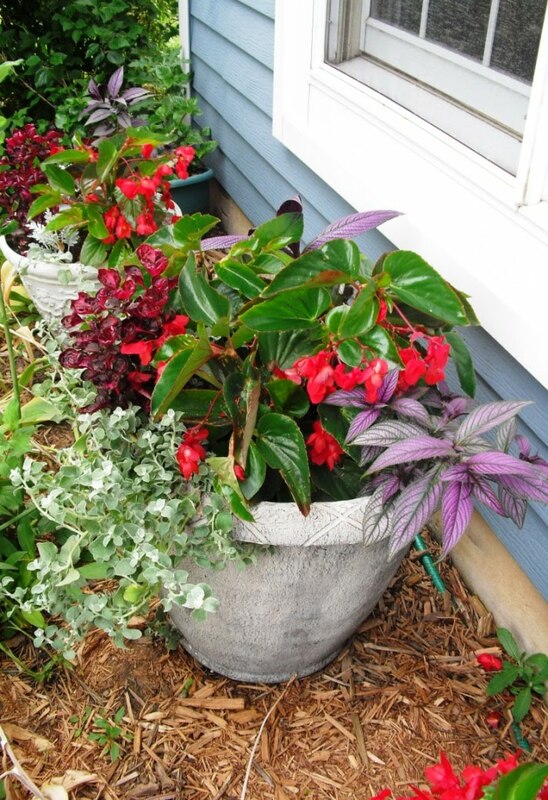 The trick will be convincing myself this fall, once frost is looming, to treat them as annuals and let them die out. Everything except the Senecio cineraria can be kept as houseplants, and I have done so in the past, with varying results. (And I admit, I'm itching to try the Dusty Miller as a houseplant, since nothing I grow indoors looks remotely like it.) Strobilanthes, although often listed in houseplant books, really does not enjoy the indoor life in my experience. I've kept a Dragon Wing Begonia going for a couple of years at a time, but they are messy, dropping flowers often and leaves occasionally. I had an Iresine for 3 or 4 years, and really loved it, but it got leggy, gangly, and unwieldy. Center pot, which is larger than the other two. Here I used Helichrysum petiolare (Licorice Plant) instead of Dusty Miller, because I wanted a trailing effect in this container. All three containers, which are under my kitchen windows, against the eastern wall of my house. These get filtered sun in the morning, because of the nearby maple tree; full sun for a brief period around noon; and then bright shade for the rest of the afternoon, as the sun is blocked by the house. 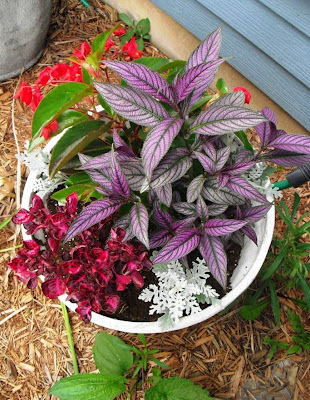 All of the plants seem happy with this arrangement, though the Persian Shields wilt occasionally during the full sun period. I guess I need to face facts: I hate letting perfectly healthy plants succumb to frost. So I'll probably salvage one Iresine (there are three, one per pot) and one Dragon Wing (there are five, one in each of the smaller pots, and three in the large pot.) And I'll probably plant the Dusty Miller in the ground, if I can. These are supposedly tender perennials, typically grown as annuals, and usually listed as hardy only to zone 8. However, here in zone 5, I've had them return from the roots for three and four years running. One finally died after it flowered in its third year; the others have never achieved flowering size.